Right, I need to tell you a secret. I love Ben & Holly. If you have no idea what I'm talking about, then Ben & Holly's Little Kingdom is a tv programme aimed at 3-5 year olds, from the makers of Peppa Pig. In fact if you listen carefully you will recognise most of the voices. Ben is an elf and Holly is a fairy princess, and between them, Nanny Plum, the Wise Old Elf, a ladybird called Gaston who thinks he's a dog and magic jelly they cause confusion and delay! What I really love about Ben & Holly is that although designed for small children, quite often the humour is designed for adults. For instance no child is going to understand the reference in 'It's mutiny! Mutiny on the Bunty'!! It has me in stitches quite often and I think it's just a shame that Girl has decided to leave Nick Jr behind in favour of Disney Jr and Boomerang. But when she's not around the other 2 quite happily sit and watch Ben & Holly. In fact Bug refers to all ladybirds as ''olly'. So when we were offered the chance to review the Little Castle Magical Playset I eagerly snapped it up! 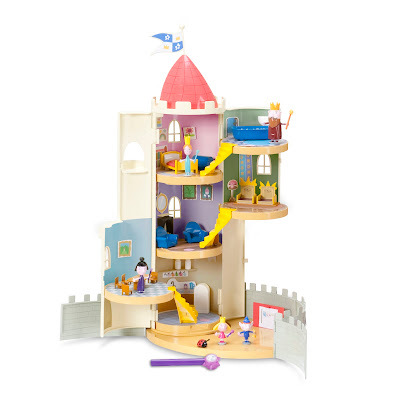 The Little Castle Magical Playset is aimed at boys and girls aged 3-5 years old. Both Girl and Boy couldn't wait to play with it!! This beautiful magical castle opens up to reveal 6 rooms, which have various play features and are activated by using Holly’s magical wand! The wand has a magnet inside which opens different things or makes something pop up. This colourful set includes the castle with Courtyard, Holly’s Wand and figures - Princess Holly, King, Queen Thistle, Nanny Plum, Ben Elf and Gaston. It arrived and we eagerly tore the box open - only to find it needed assembling. Actually putting it together didn't take too long but it had lots of fiddly stickers which needed to be put on in the right places, over 50 I think, and it took me nearly an hour to do - and that was without help from small people! The children were delighted with the Castle - all the different rooms, stairs, doors, and they loved using Holly's 'magic' wand to open the fridge and light the fire. However I was surprised and disappointed by the size of the figures. Ben & Holly are barely an inch tall - they are really tiny, which means I have to keep the playset out of the reach of Bug as she could easily choke on the figures if she put them in her mouth. Gaston in particular is easily swallowable. For a playset designed for 3-5 year olds I would have expected much larger pieces, similar to the Peppa Pig characters that come with the Peppa Pig playsets. Also, it is quite hard to get the adult characters to stand up. Having said that though, the children were very happy and didn't seem to mind the characters being a bit small. They did find the stairs a little fiddly as these have to be tucked under to close the Castle, but with some help from a grown up they managed. All in all, this is a lovely toy which the children will get much use from, as long as they don't lose the tiny figures. 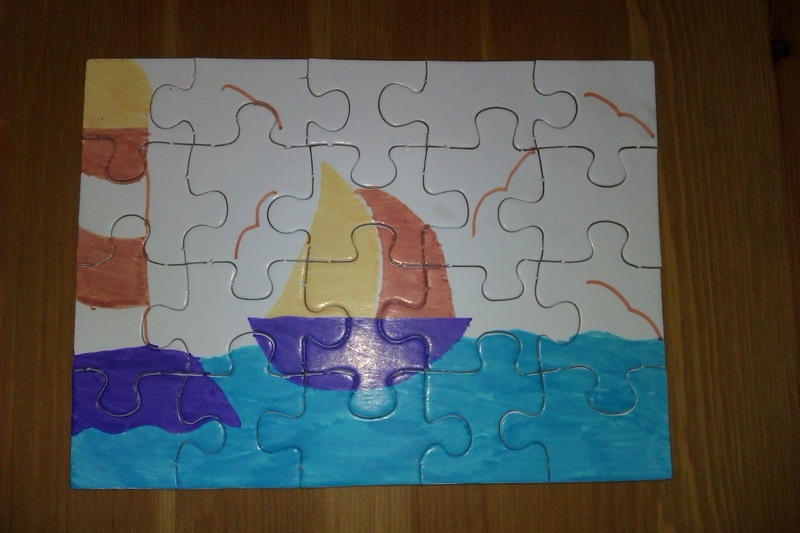 I was sent the Design Your Own Jigsaw Puzzle by 4M to review. 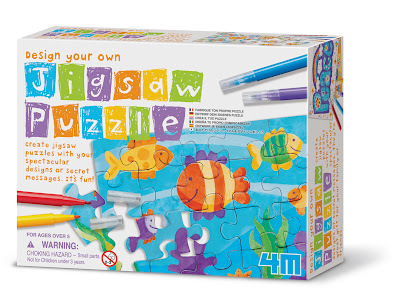 It comes with 3 blank precut jigsaws and pens to draw your own designs. Your child can then create their own picture or design which then becomes a jigsaw. I particularly like the idea suggested on the box of using them to create secret messages - very Famous Five!!! Girl, while enthusiastic, is still working on her artistic talent and with her autism at present currently has the attention span of a goldfish, so I asked some daughters of a friend to have a go when we were having a craft night. 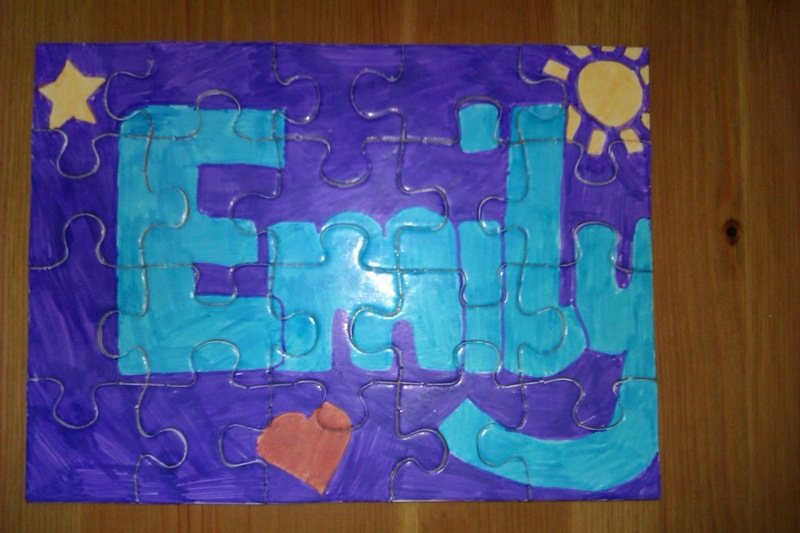 They came up with 2 lovely, different designs as shown below, and had great fun doing it. 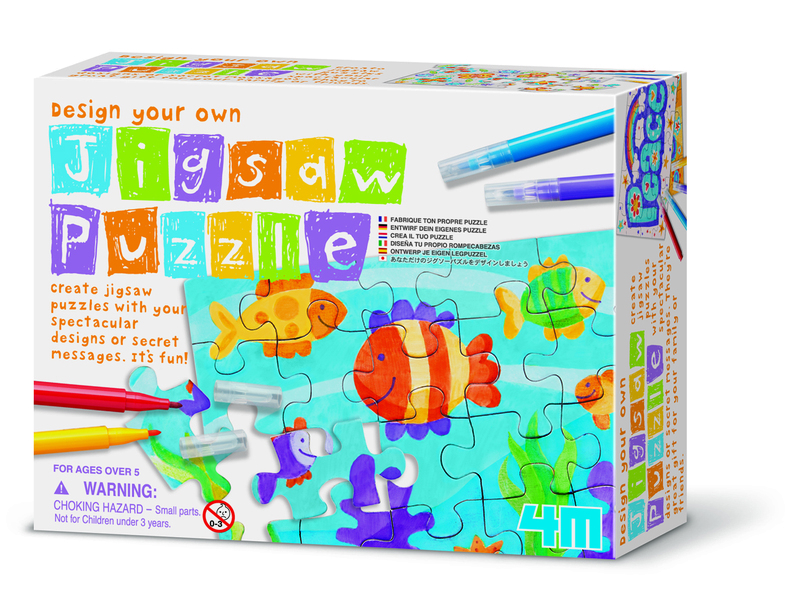 These jigsaws would make a great project to have in for a rainy day, or a present for a girl who is into secret clubs!!! I was sent this product for the purpose of review - no financial incentive was given. The opinions given are my own.